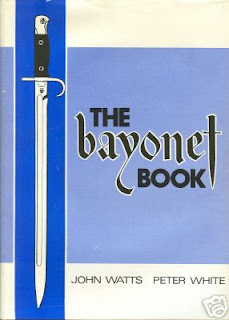 Bookride: The Bayonet Book. John & Peter White Watts, 1975. What it says on the tin. Guide to all bayonets of all countries of all times. Art book size. 504 pages with an index. 1052 plates in black and white. VALUE? 4 copies were on ABE in mid 2006 at $500-600, now there are 2 at similar prices. meanwhile at Amazon 2 copies have also sold with an arrant relister sitting on Biblio at an unhinged $1200 and a BIN on Ebay as we speak at $475. Looks like a $400 minimum book and thanks to ebay lister for this fine pic. The ebay one should go although I have never met or chatted with a bayonet collector. Perhaps it's a hereditary thing, like 'this family has always collected bayonets.' Collecting is a mysterious and wonderful thing.